Papeete is the bustling capital of Tahiti and her islands (a collection of 118 islands). 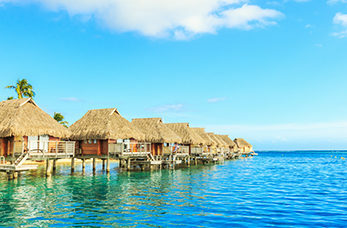 Tahiti is a scenic island with lush landscapes, cascading waterfalls, beautiful black sand beaches and turquoise blue lagoons. The Museum of Tahiti is considered one of the best museums in the South Pacific, it tells the secrets of Polynesian history and culture and features a collection of tiki, statues carved out of wood or stone. Head through the village of Tiarei to the valley of Faarumai which home to three breath-taking waterfalls, Vaimahuta, Haamarere Iti and Haamarere Rahi. Remember to take your camera to snap these picturesque waterfalls. Capt. James Cook's expedition observed the transit of the planet Venus as it passed between Earth and the Sun in 1769 at Point Venus. This historic site is where Captain Cook used brightly coloured flowers and a lone tree as a navigational landmark, it also offers spectacular views of the surrounding area.